Optimising chemical processes is difficult because it often involves a trade-off between competing parameters and the perfect conditions might not exist. For example, increasing the yield in a chemical reaction might be at the expense of the reaction’s selectivity so chemists frequently have to compromise. 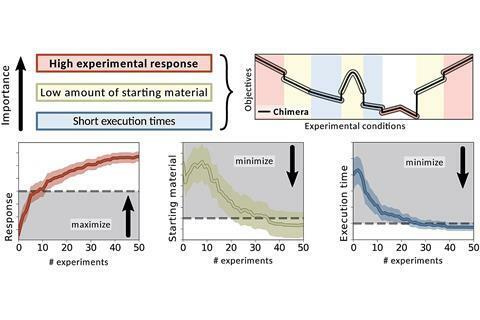 Alán Aspuru-Guzik and his group, who have just moved to the University of Toronto, have created an algorithm to handle such decisions that they have called Chimera. In contrast to other multi-target optimisation algorithms, Chimera does not need any prior knowledge of the process and you can tell it to prioritise the objectives that you think are the most important. Inspired by its mythical Greek namesake, Chimera constructs a single scalarised objective function from a whole set of different targets. It uses hierarchical methods with a priori multi-objective optimisation – this means it can find Pareto optimal points while staying true to predefined priorities. Chimera performs at least as well as another leading optimisation approach, c-ASF, which John de Mello and his group from the Norwegian University of Science and Technology designed for self-optimising reactors.2 Aspuru-Guzik’s team tested both c-ASF and Chimera on an auto-calibration procedure in a virtual self-driving laboratory. The goal was to maximise the response of a high-performance liquid chromatography (HPLC) experiment while minimising the amount of sample used. Chimera was able to achieve this goal quickly and with a smaller number of experiments than c-ASF.